We are sorry if you missed this one - but don't despair, there are many other brilliant artists still to come. Two day workshop covering country landscapes, buildings and flowers. 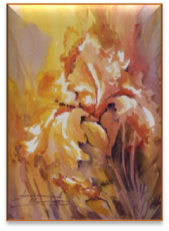 Jenny is an exhibiting member of the Royal Art Society of NSW, the City of Ryde Art Society, the Drummoyne Municipal Art Society and the Bellingen Art Group. 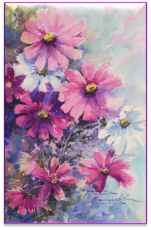 She has held many exhibitions in Canberra, Sydney, Newcastle, Rockhampton, Inverell and Dorrigo and has published two books: Capturing the Australian Light in Watercolour and Watercolour Flowers Fast, Fresh and Free. 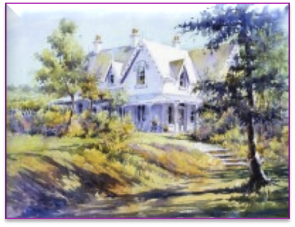 Jenny has also released three DVDs - they all feature a series of watercolour tutorials and are titled: Australian Country Cottages, Australian Country Landscapes and The Old Bush Shack. 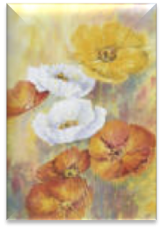 Currently, Jenny holds workshops for adults at her home studio in Megan and in her gallery in Dorrigo. She has demonstrated for numerous art societies, art schools and arts events, including the Mitchell School of Arts at Bathurst, Murrumbidgee School of Creative Arts in Wagga Wagga, Grafton Artsfest, and Camp Creative in Bellingen. Cost: $170 – Includes morning and afternoon tea (please advise if you have food intolerances). Participants are to bring their own cut lunch. Details of any specific student materials will be provided on enrolment. However Jenny has advised that in the main, your usual materials will suffice. It is important to advise the coordinator after you have made your payment, to confirm your method of payment and to secure your place in the workshop. PLEASE RING/SMS/EMAIL IF YOU HAVE ANY ENQUIRIES.